This is my favorite Greek vegan dressing, hands down. There is a secret ingredient and I’m going to share it with you. It gives a zest and zing to the flavors that will have you licking your fingers with joy. The secret ingredient is mustard powder! 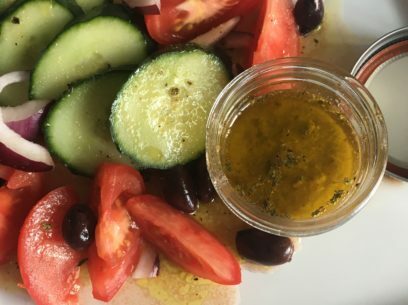 You don’t taste mustard, it just amps up all the other ingredients giving you a dressing you’ll put on salads, use as a veggie dip and sop up every last drop of with bread. Combine dry ingredients in a bowl and mix well. Add wet ingredients except for the oil. Once the wet/dry ingredients are combined, drizzle in olive oil as you’re stirring. At this point, I like to pulse the dressing in the blender 2 or 3 times as it really pulls the whole thing together nicely. You can skip this step if you like and your dressing will still be delicious. This recipe makes a little over a cup of dressing. It’s so good you’re going to want to show it off – fill pretty glass with chopped salad veggies and serve with grilled mini pitas. As lovely as it is tasty! My family couldn’t stop eating this dressing! Soon yummy! Delicious! I first had this when my sister made it. Now it’s my go-to dressing. No need to buy dressing at the grocery store. You must have read my mind. I was just thinking that I need to research what dressing they put on greek salads in Greece. It never tastes the same here. Thank you for posting! These is a delicious dressing! It was just what I was looking for. Used it for a spinach salad with roma tomatoes, cucumbers, olivers and pepperoncinis. This is sooooooo good! Love your recipes!